When I was a kid, my mom would give me a small, clean towel before my bath. “Maghilod!” she would say. My bout with scars from breakouts and skin allergies coupled with my mom’s constant reminder have made me a stickler for exfoliation. I like how it makes me feel squeaky-clean and extra fresh afterwards, plus it actually improves blood circulation in the process. My skin is still far from perfect but regular exfoliation has made my scars lighter and my skin a little less rough and dull-looking. Here on PV, we’ve often talked about exfoliation as it relates to our facial skin care routine. From choosing which exfoliant would work best for you to how to actually incorporate it in your skincare, we’ve got it covered! But the rest of our bodies need some TLC as well, and if you do hair removal like shaving your legs or waxing your pits, exfoliation is a must for preventing the growth of ingrown hair. You can exfoliate with tools like loofahs or washcloths as I did, but if you want extra skincare benefits, a body scrub may be better suited for your needs! Having coffee as a main ingredient in your body scrub does wonders as coffee is recognized as a natural antioxidant that can help slow the appearance of signs of aging. Caffeine is a natural constrictor that aids in tightening the skin, making it look smoother and more radiant. You can actually use the grounds from your morning brew but if you’re not a drinker, try the Bench Coffee and Honey Body Scrub (P149 at Bench). It has both coffee and honey, the latter of which is also a great antibacterial ingredient that can help cleanse and soothe the skin. While the scrub smells more like caramel sauce than coffee, it’s quite a gentle brightening exfoliant that doesn’t feel like it’s scratching my skin. If you’re looking for an exfoliant that goes deeper than the surface, getting a scrub powered with milk or lactic acid may be your best bet! Known as one of the gentler AHAs and best for those with sensitive skin, it can help revitalize your skin by getting rid of lines, dark spots, and signs of aging or sun damage. A luxurious milk bath would be nice but budget-conscious beauty lovers can get the same benefits from the Purbasari Lulur Mandi in Milk and Yam Bean (P85 at Watsons). This traditional Indonesian body scrub also contains yam bean, which is a source of vitamin C and can help brighten the skin. The scrub is quite thick and creamy, with very small beads that wash right off. It also has an intense floral scent that may not be for everybody. Salt is of the most common and popular ingredients for body scrubs as it contains minerals that can help soothe and revitalize the skin. Sea salt is the most common type of salt used but be wary of extremely chunky formulas! Bigger salt grains are very effective but they can be pretty abrasive so it’s best to only use them on parts of the body that have thicker or tougher dead skin cells, such as elbows or knees. Liz has raved about the OG version but you may also want to try A Bonne’ Spa Yogurt Salt (P80 at Watsons) since it has the benefits of salt as well as milk! This strawberry-scented salt scrub feels quite abrasive as it does not easily melt off but it worked really well on my dark knees, making them look so much lighter even with just a couple of uses. If you’re one to enjoy a good cup of tea, you’d be no stranger to how extremely relaxing chamomile could be. It’s a known antiseptic and antibacterial ingredient that helps ease tension off the body, so why not have it in your scrub? Chamomile body scrubs are best used by those with very sensitive skin as it is hypoallergenic and aids in calming redness and irritation of the skin, even acne. 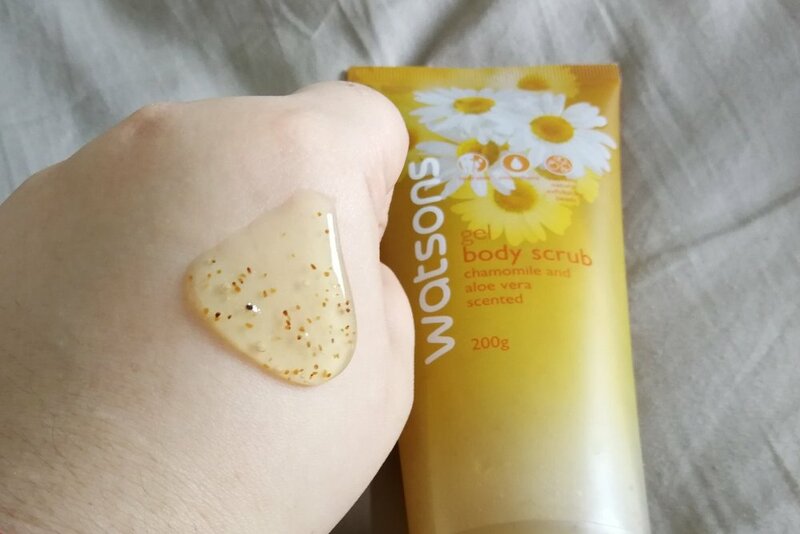 Watsons Chamomile and Aloe Vera Gel Body Scrub (P89 at Watsons) is a bang-for-your-buck scrub that is worth a shot. It’s quite a mild scrub so you may feel like it’s not doing anything, but it leaves the skin feeling well cleansed and bright. Glutathione is popular in the local beauty scene because of how it makes the skin look fairer and brighter. Even if you’re not interested in whitening, glutathione can be a good choice because it’s a powerful antioxidant that can reduce the appearance of dark spots and dull skin. Liz has previously reviewed the Gluta-C Intense Whitening Body Scrub (P99 at Watsons), which worked well for preventing ingrown hair. However, we realized too late the beads are made of polyethylene (or plastic microbeads), which are bad for the environment so we won’t be using this particular product again. Body scrubs are good additions to your shower routine, both for getting a little more pamper-me-time and for keeping your skin bright, healthy, and smooth. There are plenty of budget options available - in fact, everything on this list is under P150! What’s your fave kind of body scrub?